Godhead Study 4: Was Jesus created or literally begotten? Godhead Study 3: Is Jesus God? Godhead study 2: Does old testament support more than one person Godhead doctrine? Godhead study 1: Does Old Testament God has a son? ​Why some Christians don’t bear fruit? ​Which caste does Christ belong to? Are there contradictions in the writings of Ellen G. White? The Investigative and Millennial Judgment. Dan 7:10 A fiery stream issued and came forth from before him: thousand thousands ministered unto him, and ten thousand times ten thousand stood before him: the judgment was set, and the books were opened. So the judgment happens after the reign of 4th beast power. that is after 1798. This judgment is investigative in nature. There terms like the judgment was set and books were opened shows us that the judgment was investigative in nature. So the blotting out of sins from the records we saw in Dan 7:10 happens in future. This judgement should be only for saints, why? Bible says Judgment begins in the house of God i.e., righteous will be judged first. The judgment of the wicked happens in the millennium. The saints judge the wicked in the millennium. The wicked who will be part of second resurrection will be receiving their punishment after the third coming of Lord. Rev 20:9 And they went up on the breadth of the earth, and compassed the camp of the saints about, and the beloved city: and fire came down from God out of heaven, and devoured them. Rev 20:12 And I saw the dead, small and great, stand before God; and the books were opened: and another book was opened, which is the book of life: and the dead were judged out of those things which were written in the books, according to their works. Posted on July 29, 2013 July 29, 2013 Categories Sanctuary, Second Coming, Secret RaptureLeave a comment on The Investigative and Millennial Judgment. Did early church Fathers or protestant reformers believed in coming of Jesus will be secret? Is there any biblical base for secret rapture doctrine? Bible talks about Jesus coming unexpectedly (suddenly) without any information but there is no single Bible verse which tells that Jesus coming will be secret. If it is not taught by early church Fathers and protestant reformers and neither it is found in the Bible then how did this come into christianity? Protestant reformation movement believed and taught that Pope is the antiChrist. The catholic church wanted to divert this charge of Pope as antichrist by turning away the focus of antichrist into future. Jesuit doctor of theology, Francisco Ribera, in his book Sacrum Beati Ioannis Apostoli, & Evangelistiae Apocalypsin Commentarij proposed that the prophetical periods of 1260 days, 42 months and three and half years into future and do not apply to Papacy. Manuel De Lacunza (1731-1801), a Jesuit priest from Chile, also advocated futurism in his manuscript entitled La Venida del Mesias en Gloria y Magestad (“The Coming of the Messiah in Glory and Majesty”). Writing under the assumed name of Juan Josafa (Rabbi) Ben-Ezra, Lacunza hoped to obscure the fact that he was a Catholic, in order to give his book better acceptance in Protestantism. Church of Scotland minister, named Edward Irving, was influenced by this book and translated it. John Darby, an Englishman and pioneer of the “Plymouth Brethren” movement became caught up in the rapture philosophies of Irving. When Darby heard about Irving’s activities, he traveled to Scotland to talk with Irving and his followers about the “secret rapture”. It was Darby who became the master developer of “scriptural” arguments to support the theory/doctrine that evolved. Darby’s development of the “rapture” theory has since become widely popularized in Britain and finally in the U.S., largely as a result of Cyrus Scofield’s notes in his Scofield Reference Bible. What manner of coming will be Jesus second coming? Bible tells us that second coming of Jesus when the saints gets resurrected will be loud, noisy and the whole world including the wicked will see it. It will be an unexpected event but not a secret event. The dead in Christ will rise up on this day. Note. 1. Lord will descend with a shout and with the trump. 2. The dead in Christ shall rise first. Note: 1. The trumpet will sound. Trumpet ofcourse is a very loud instrument 2. The dead in Christ will rise up. Blessed Millennium- Is it in earth or in Heaven? The only place we read about the Blessed Millenium is in Rev 20. Let us do a verse by verse analysis to find where this millennium will be. Verse 4 : And I saw thrones, and they sat upon them, and judgment was given unto them: and I saw the souls of them that were beheaded for the witness of Jesus, and for the word of God, and which had not worshipped the beast, neither his image, neither had received his mark upon their foreheads, or in their hands; and they lived and reigned with Christ a thousand years. Verse 4 tells us that the righteous will reign with Christ for 1000 years. Verse 5: But the rest of the dead lived not again until the thousand years were finished. This is the first resurrection. Verse 5 tells us that those who take part in the first resurrection will be the ones who reign with Jesus. Also it tells us that the wicked will be dead during the 1000 years. verse 6: Blessed and holy is he that hath part in the first resurrection: on such the second death hath no power, but they shall be priests of God and of Christ, and shall reign with him a thousand years. Verse 6 tells us that there will be a second death to the wicked. But the righteous who took part in first resurrection will reign with Jesus. Verse 7-9,14: And when the thousand years are expired, Satan shall be loosed out of his prison, And shall go out to deceive the nations which are in the four quarters of the earth, Gog, and Magog, to gather them together to battle: the number of whom is as the sand of the sea. And they went up on the breadth of the earth, and compassed the camp of the saints about, and the beloved city: and fire came down from God out of heaven, and devoured them. And death and hell were cast into the lake of fire. This is the second death. At the end of 1000 years there is a second resurrection where the wicked are resurrected to be punished with fire and the fire from heaven devours them. And this is called the second death. So there are 2 deaths and 2 resurrections. First death: For both Righteous and Wicked. Second Death: For the wicked. For the Lord himself shall descend from heaven with a shout, with the voice of the archangel, and with the trump of God: and the dead in Christ shall rise first: Then we which are alive and remain shall be caught up together with them in the clouds, to meet the Lord in the air: and so shall we ever be with the Lord. Those who take part in first resurrection and those who are transformed alive will be caught up together with Jesus in the clouds and will be ever with the Lord. The millennium will be in Heaven. John 14:2,3 In my Father’s house are many mansions: if it were not so, I would have told you. I go to prepare a place for you. And if I go and prepare a place for you, I will come again, and receive you unto myself; that where I am, there ye may be also. When the saints are in heaven the earth will be desolate without any living creature except Satan. This “great day of the Lord” will come “as a destruction from the Almighty” (Joel 1:15). “And the slain of the Lord shall be at that day from one end of the earth even to the other end of the earth: they shall not be lamented, neither gathered, nor buried; they shall be as dung upon the ground” (Jeremiah 25:33). 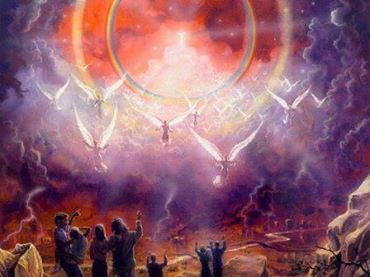 Rev 21: 2 And I John saw the holy city, new Jerusalem, coming down from God out of heaven, prepared as a bride adorned for her husband. Posted on June 10, 2012 July 26, 2013 Categories Doctrines, Second ComingTags second coming3 Comments on Blessed Millennium- Is it in earth or in Heaven?